Helen Mirren is the prime suspect for acting honours in this adaptation of a Barry Unsworth novel about treachery and betrayal. She's the Austrian painter torn between bogus archaeologist Charles Dance and seedy spy Ben Kingsley, the Pascali of the title. Her love and loyalty are as divided as Nisi, the Turkish-occupied Greek island in 1908 as the Ottoman empire crumbles around them all. 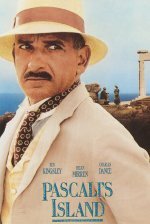 Pascali's sexual ambiguity is beautifully observed by Ben Kingsley, but it's the observed beauty of Helen Mirren which upstages languid atmospherics and lyrical vistas.